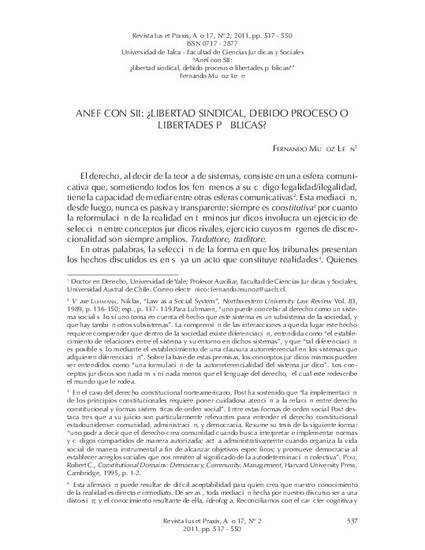 ANEF con SII: ¿Libertad sindical, debido proceso o libertades públicas? On September 16, 2011, the Court of Appeals of Santiago decided "Agrupación Nacional de Empleados Fiscales y otro con Servicio de Impuestos Internos", annulling salary deductions affecting public servants that went on strike on the basis of due process. This solution, however, is unstable as it depends on the mistaken deductions made by the administration. Much less promising for public sector workers is to invoke their labor law rights, which the very Constitution constrains. In this paper I argue that a better balance would be achieved by putting at the center of judicial intervention the civil and political rights of public sector workers, guaranteed by Convention 151 of the International Labour Organization.